Pour the whole milk into a container, I used my glass measuring cup, and crush the Lucky Charms cereal and add it to the milk. Allow this to sit at room temperature for about 20 to 30 minutes to steep (the flavor from the cereal will go into the milk). Once the milk has steeped then strain the milk through a fine mesh strainer and discard the cereal. 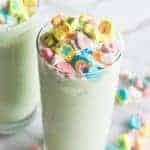 Add the Lucky Charms marshmallows to a blender, mix until the marshmallows are fine crumbs, add the vanilla ice cream, milk, and green food coloring. Blend until combined and shake like consistency. Add more milk or ice cream as needed to get to desired consistency. In small mixing bowl add the heavy cream mix on high speed for about 1 minute then add the powdered sugar and vanilla extract. Continue to beat on high speed until soft peaks form. Pour the shake into glasses, top with whipped cream and sprinkle with additional marshmallows. Serve immediately and enjoy.